Grand is one word that comes to mind when you think about Indian weddings. Festive ambience, plenty of colours, sounds of laughter and delicious treats - we are surrounded by it all when we step into the big fat Indian wedding. For generations, we have had task lists being handed out to everyone for different things - food, transport, decor and so much more! To continue the festivity, relatives would gather a few weeks later to browse through pictures and gifts. With increasing distance and decreasing time, these are things of the past. What if we told you, you could have all of that and more without multiple trips or extra time? Doesn’t it sound exciting? 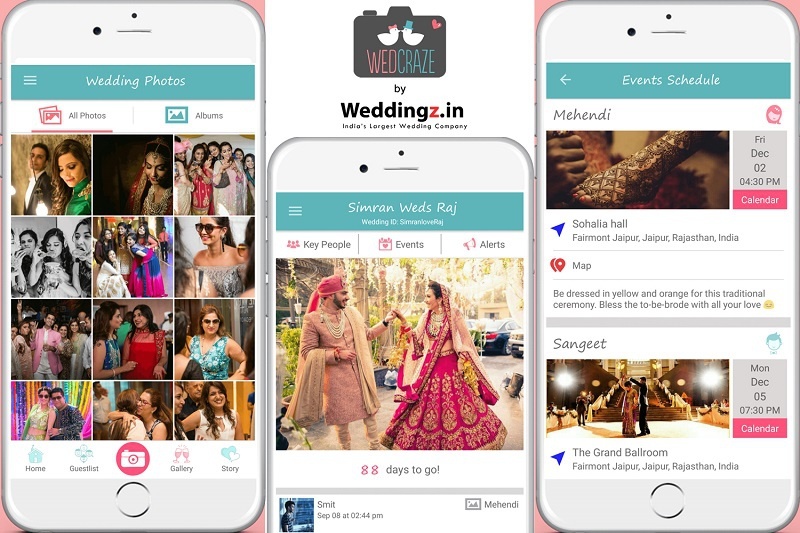 To simplify things, WedCraze has come up with a personalized wedding app that can help you do so many things, that we decided to make a list! Yes, that’s how many awesome features it offers! Put up your event itinerary on your personal wedding app and make it easily accessible to your guests. No more multiple calls for conveying the detailed plan and schedule to every individual guest. The app also sends out reminders to all your guests for every event. How cool is that? You can introduce the team Bride to team Groom via the WedCraze app. People can start interacting before the D-Day to make things more fun on the big day. Now, you need not ask your masi about the cute groomsman you noticed ;) It is also a great opportunity for you and your loved ones to connect on one platform and just unwind! A wedding in India sees friends and families coming together from across the world and nothing like this platform to share your story with them. Whether it’s about your meet-cute or your childhood love story, you can share it here with your loved ones. It’s also a great way for them to understand you two as a couple. And if you want any help, their content writer comes on board to weave magical words together for your love story! Every wedding has those tiny change of plans which threatens to throw everyone into panic mode. Well, you can say goodbye to that! With WedCraze’s app, you can inform all your guests about any change in plans and keep them updated. It is also great for broadcasting any announcements. Now, you can do away with various groups and you need not keep a tab on hashtags. All your guests can share their photos on the app and you can check out every candid and not-so-candid moment from the big day. Well, a trip down the memory lane never hurt anyone and especially so when it’s about your most special day. Re-live the moments, share the jokes and browse through pictures all over again - everything is available on the app! Unlike other mediums, the Wedcraze app is absolutely safe and secure. The photos and details can be seen by people you choose to add to the app. No more photos doing the rounds of social media without your permission! The app is available on Google Play Store and App Store. Yes, it is that simple. Isn’t that great? To know more, you can check them out here.